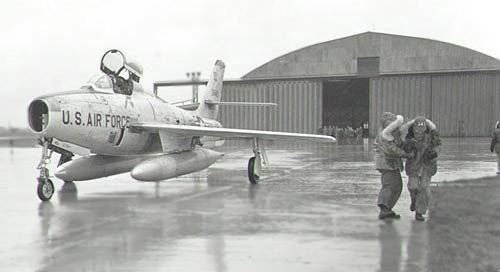 An F-84 Thunderstreak, Sembach Air Base Germany. Sembach Air Base, Germany. An F-84 Thunderstreak in front of hangar 429, Sembach Air Base Germany. Photo courtesy of Mike Butrovich, and Ron Ruiz. Date of this photo is unknown.